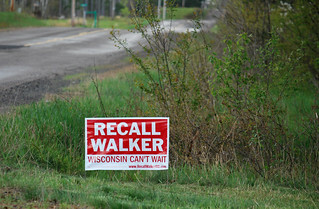 I blogged about the Wisconsin Governor's Recall Election back at this post. That was after the recall primary but before the election. 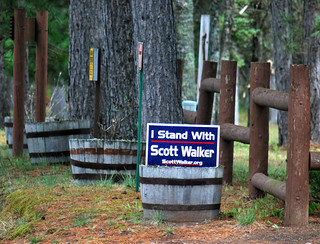 At the time, the roadsides in Douglas County sported only Walker and Anti-Walker signs. 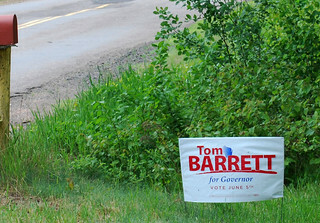 But shortly thereafter, the Anti-Walker signs were replaced with Barrett signs. They came in a couple of flavors. The election day arrived and people turned out to vote. 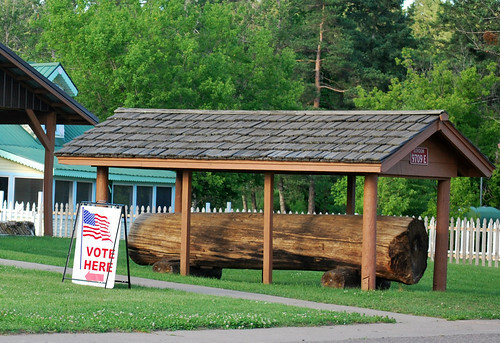 Here is the polling place in Gordon. Remember, this was White Pine territory! The final results showed Walker retained his seat. It took 45 minutes from the time the polls closed to announce this. Some say the results were ready much earlier but drama was needed. 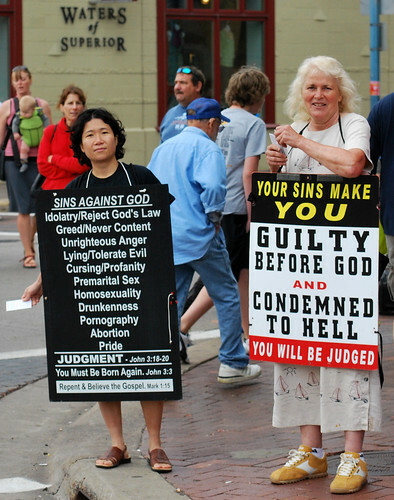 The anti-Walker folks did supply plenty of drama. This one complained (skip to about 1:24 if you don't want to watch the whole thing.) This one cried. These looked appalled. 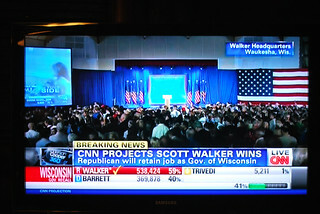 Apparently, Walker's victory is a minor record worthy of note. There have been three recall elections of sitting governors. 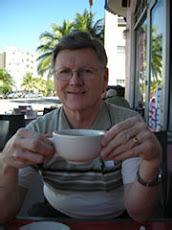 This is the first one that the incumbent won. With that out of the way, the Governor could once again take on major issues in the state and he wasted no time proclaiming June 12th as Jack Link's Beef Jerkey Day. Now how could anyone challenge a governor willing to do that? Seriously, University of Wisconsin law professor, Ann Althouse, covered the election like a blanket. One of her most serious concerns was wasting $18 million on a special election. But, the election really did produced a split opinion. Washburn county, home to Minong and Jack Link's jerkey empire produced a 57%-42% vote favoring Walker, as was the case in most rural counties. My nearby Douglas county went 64%-35% for Barrett! Well, they have a university. Perhaps someone should analyze it in university versus non-university terms. And how did it go in the 3 local townships? Definitely a split opinion. 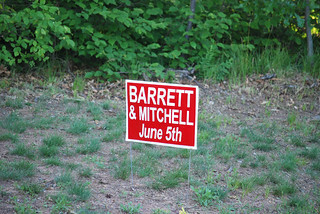 An election every 60 days for more than a year? I usually complain about the fact that a half-million people pay Wisconsin property taxes with no voice in how our tax money is spent - say didn't somebody fight a war about taxation without representation? But maybe it would just be an issue of fairness to balance the University influence with some taxpayer influence. After watching Grandma's Marathon in Duluth this weekend, we met our Marathoners and Linda's family at the house they were renting just south of downtown. On the way there, I spotted an "airplane on a stick." 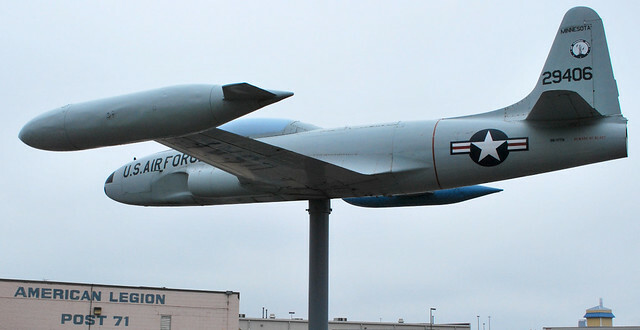 This one is a T-33 trainer in the parking lot of the American Legion Post 71 on Grand. You might be able to spot it from I-35 heading South at exit 251B. 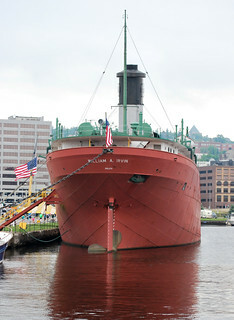 The address is 5814 Grand Ave., Duluth, MN. If you stop to visit, be sure to go inside the post and then look back toward the outside, up above the entrance. There is an excellent description of the plane. There is a plaque at the base of the plane with additional information too. The T-33 is actually a variation of the P-80/F-80 in which the fuselage was lengthened and a second seat and set of controls were added to make it into a trainer. A lot of air force pilots flew this plane as their first jet aircraft. 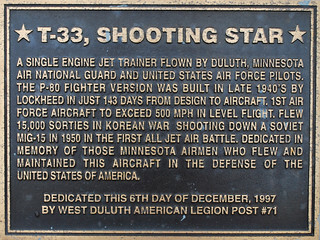 Notice that this plaque claims the plane flew 143 days after design began. I'll bet you can't get a contract signed with the Air Force in 143 days now. Click on the "Airplane on a Stick" label at the bottom of this post to see other planes I have in this collection. 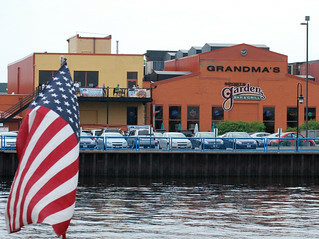 Saturday was the 36th running of Grandma's Marathon in Duluth. Linda's niece and sister-in-law were both running so we drove the 40 miles from our cabin in Gordon, Wisconsin to Duluth to cheer them on. 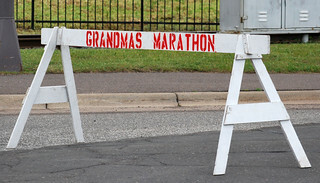 The marathon is named for Grandma's Restaurant, the only business in town that would step forward to sponsor the race back in 1977. 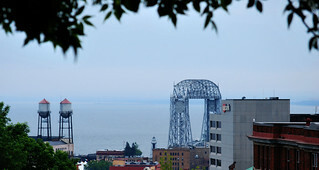 We parked high on the hill above Duluth by Cascade Park and had a scenic view of the harbor, downtown buildings and the Aerial Lift Bridge as we descended to the race route on Superior Street. 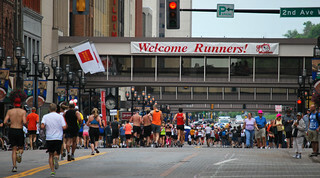 The "average" marathoners were just coming up the last hill on Superior Street and had about a mile and a half to go as they approached the downtown Welcome sign before turning toward the finish line at Canal Park. 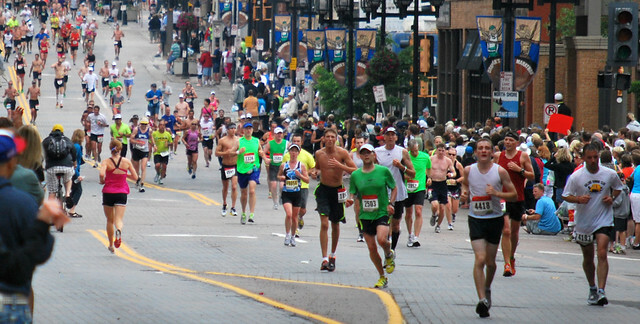 As at many other marathons, Cowbells are the instrument of choice for cheering the runners. 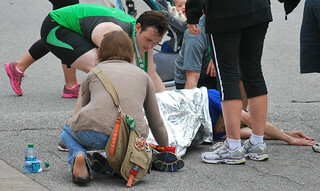 Here a runner checks their pace as a viewer anxiously watches for their runner. If you aren't familiar with the phrase "More Cowbell," the history of it can be found here. 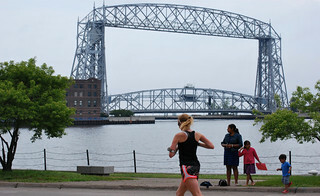 This race is about as multicultural as things get in Duluth. 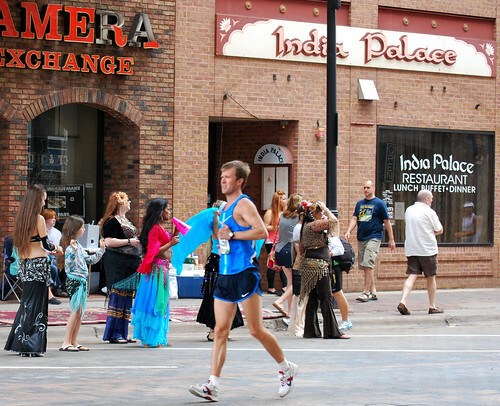 After an initial few wins by Minnesota's pale-skinned Scandinavian runners, the Africans now regularly win the race (including this year) but are cheered on by the local belly dance club who stand and cheer in front of the local Indian restaurant. 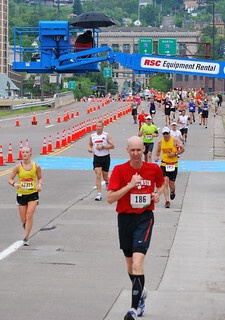 The race passes by the famed Aerial Lift Bridge just before the finish line. 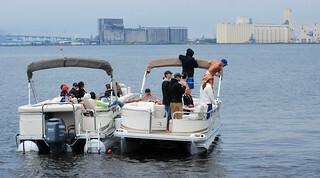 If you are not in tip-top condition, you would be better off just having a beer and watching from a pontoon boat in the harbor. Otherwise, you risk ending up on the ground writhing in considerable pain and agony. 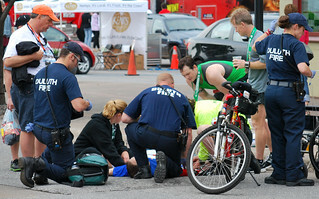 I am pretty sure that fellow was just suffering cramps and not the wrath of God, but you never know. These ladies in Canal Park might suspect otherwise. 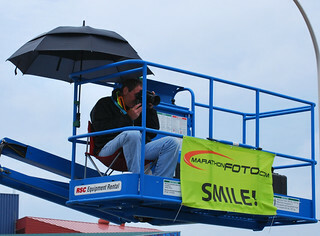 There are lots of good places from which you can photograph the race, but the commercial photographers do have an inside track. You can check out their work here. Did I mention that the temperatures were cool? 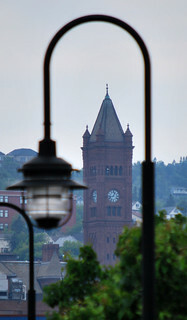 We left Gordon, Wisconsin, with a temperature of 78 and thirty five miles later, the reading was 57. 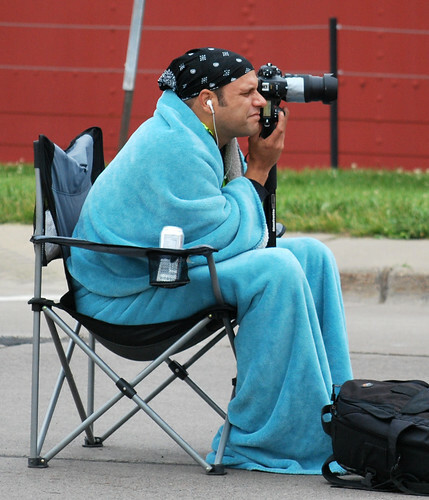 Good for runners, but for photographers, not warm enough. Seeing pictures of someone like this on June 16th is probably what makes my California relatives wonder if the snow ever melts in Minnesota. 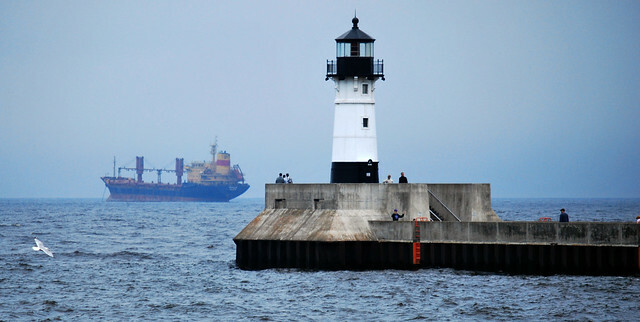 Well, cool or not, Duluth really is a pretty port town. Just dress for San Francisco type of weather. 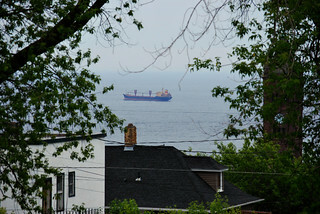 And don't be surprised if the weather changes several times during your stay. 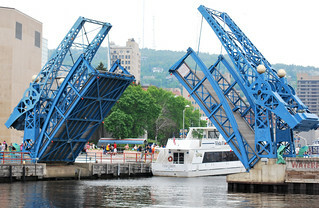 Canal Park is the highlight of most people's trip. 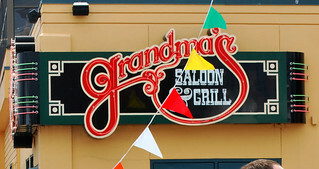 Enjoy it - and maybe you should even stop in at Grandma's.